This is a Limited Release 2.8 Prime MC compound Tire. 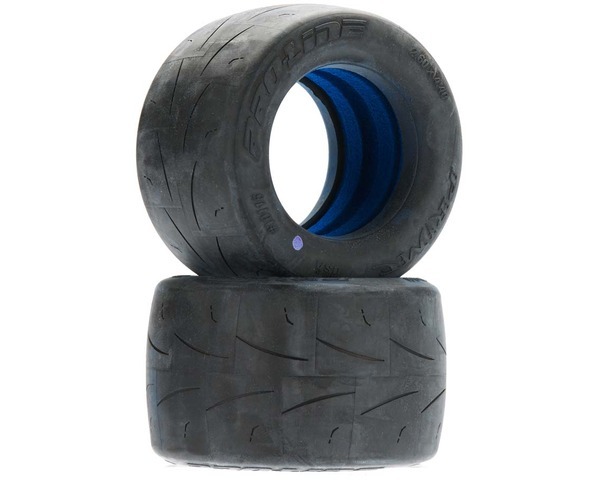 Pro-Line has a new indoor clay Tire for 2.8 Monster Truck fans! The Prime 2.8 is almost a complete slick tire that will put the maximum amount of rubber down on indoor clay surfaces for incredible traction. The Prime 2.8 tire comes with Pro-Lines 2.8 Closed Cell Foam and a specifically designed tire carcass shape that prevents extreme tire expansion! This limited edition tire allows you to have a whole new level of fun with your 2.8 MT on an indoor clay track! Its Prime Time! !